The Bass & I performs a large repertoire of jazz and latin tunes. The stylish blend of double bass and male vocals creates an elegant and sophisticated atmosphere. Perfect for those seeking something a little different or unique. 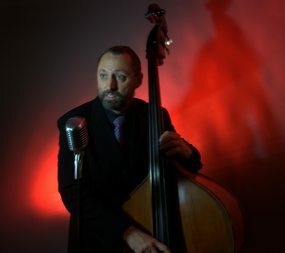 Steve Arié has performed with countless Australian greats including D.I.G., Dale Barlow, Bernie McGann, Ten Part Invention, George Washingmachine, Wanderlust, Pardon Me Boys and Frank Bennett. He has performed all over the world including two performances at the prestigious Chicago Jazz Festival, The Kennedy Centre for Performing Arts (USA), Edinburgh Fringe Festival, Ruhrfestspiele (Germany), Queenstown Jazz Festival (New Zealand) and jazz and music festivals throughout Australia.